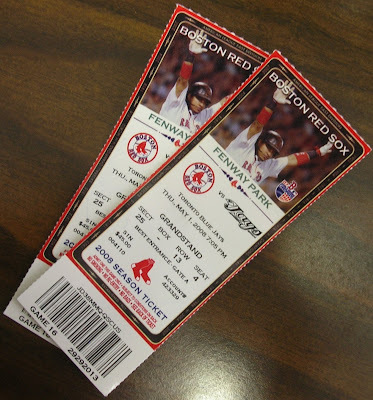 A Life of Sugar and Spice: A gluten-free Sox game? Since I'm still undergoing testing, I am not on a GF diet in order to prevent false negatives. But I'm taking my friend Allie to the game, and she just so happens to have Celiac. I also don't feel like waking up with lead in my stomach the next morning. This will be my first beer-less, hot dog-less Red Sox game at Fenway. Maybe this time I'll actually remember the game for once. I tend to go overboard on the Bud Light when I'm there and yell "Come On Manny!" and then the Pirates fan standing next to me says, "They took Manny out last inning". And then not only do I look like a stupid chick that knows nothing about baseball (which I am totally NOT by the way) I look like a stupid chick that knows nothing about baseball that also happens to be wasted. If I ever thought I'd find my future husband at Fenway that was not the way to do it I'm sure. Notice also that our seats are on the 3rd base side, I've never sat on that side of the park, I've always been on the 1st base side. I'm a sucker for the standing room only section at the top of the grandstand on the first base line. By the end of the game I almost always have front row seats and I only paid $20 bucks for my ticket. Since it's so early in the season there's a good chance I'll make it down to the front row by the end of the game tomorrow night anyway so that's good. I hope it's a good game. I'd love to see Manny hit home run number 500! Back to the Doctor's we go. Waiting for my healthy life to begin.